It was a massive success – great to see kids being able to study with real light instead of by the fire, and not having to cook in the dark. Suffice to say, we really take light for granted! The Light Up Naduri Project is being undertaken for many reasons. 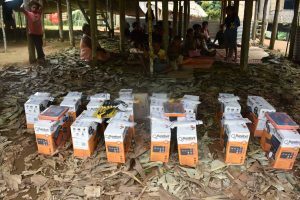 Back Track Adventures, through our Kokoda Treks, is the village’s major employer and therefore the major source of income for the people of Naduri village. Currently we employ approximately 120 people from the village. There welfare and that of their families is important to us. Anyone who has joined us for a trek will known what kind-hearted people the residents are and how supportive they are of visitors; the village livelihood and future is important to us. Naduri Village is made up of four clans – approximately 500 people in total. 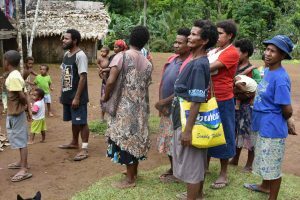 Currently 300 are living in and around Naduri with a further 200 living In Port Moresby. Many of Naduri’s youth are considering moving to Naduri as life in the villages is never as appealing as the bright lights of the big city. unfortunately Port Moresby offers little to no chance of worthwhile employment and many of the young people moving to Moresby are soon disillusioned and fall into anti-social activities. Village life currently provides the best hope for the youth from these areas. Every opportunity to ensure that Village life can provide a future for the young people must be explored. We are respectful of supporting their lifestyle; we are one of only two companies that currently recognise the Sabbath and do not trek on this day. Now, we are actively involved in improving the living conditions of the residents of Naduri village. Lighting 43 occupied dwellings in the village of Naduri with Solar lighting. Allow more productive time for family and the community. The Kokoda Track Foundation (KTF) is an international development organisation that has been operating in PNG for over a decade. Their purpose is to work with people and communities to improve the lives and futures of Papua New Guineans. The KTF works in partnership with communities, identifying their needs and strengths, and with them, implement projects that achieve long term changes. Over the past decade, KTF has delivered aid and development activities in the areas of education, health, livelihoods and leadership.